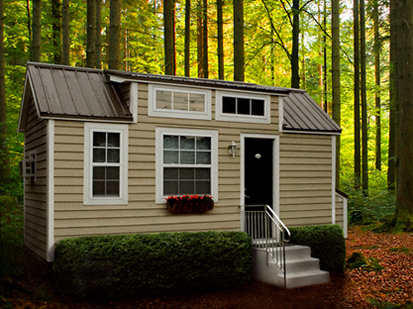 The tiny house movement is anything but tiny. They are sprouting up like mushrooms throughout the country, and so are the blogs and publications that chronicle their growth. It’s not a surprise that something so small could get so big. The economy, the retirement of baby boomers and increasing environmental awareness have pushed housing boundaries, not out, but in. People of all ages want to live more simply. Starting with your house makes sense. 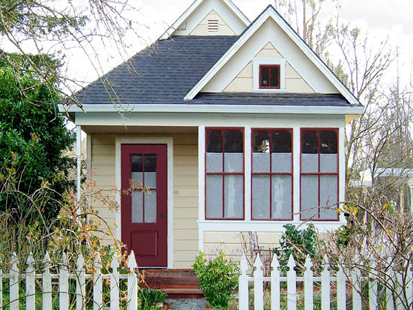 It depends who you talk to, but tiny houses tend to be under 500 sq ft, with many under 200. For example, Tumbleweed Tiny House Company in Sonoma, CA, sells plans ranging from 65 sq ft to 884 sq ft. Dan Louche at Tiny Home Builders in Deland, FL, builds houses from 96 to 160 sq ft on trailers. Andrew Bennett at Trekker Trailers in Eustis, FL, is wrapping up his first tiny house now at just under 70 sq ft.
People have lots of reasons for living in such small spaces. Some want to reduce their carbon footprint, both in building and operating a house. 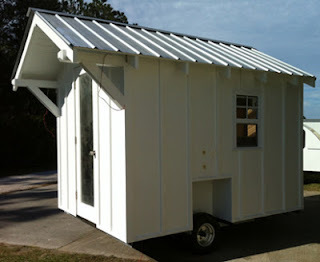 Many want to be more mobile, and tiny houses are often built on trailers. Others want to save money and still have a well-constructed wooden edifice. Still others love the reduced stress of a smaller mortgage and less maintenance. I’ve talked to some people who choose a tiny house over a trailer because of the joy of designing or building it themselves from traditional materials, and the ability to insulate it better. And everyone can agree, they’re just so darn cute. I’ve loved the idea of tiny spaces ever since I built a duplex out of a refrigerator box when I was seven. I spend at least a few minutes every day looking at a tiny house somewhere in the US. Many of them are in the western part of the country or in very rural areas. But can I dream small, really small, right here in my own county? The answer is both yes and no, and it reflects the challenges in much of the country. Part of the appeal of some tiny houses is that they are portable. Usually under 200 sq ft and built on small trailer frames, they can be pulled by everyday vehicles. But those wheels that let you roam will limit where you legally can call home in many counties, including mine, St. Johns, FL. They are treated like RVs, which are “not permitted for living purpose unless parked in a properly zoned camp ground or park,” says the county website. Being in Florida, we have plenty of campgrounds and RV parks, but what if you want to live in a regular neighborhood or have land around you? It depends. Technically, you have to lose the wheels. Most houses on trailers can be made permanent structures, if you have to go that route. But even so, your choices are limited if you want to build a tiny house. Some parts of our county are wall-to-wall developments. New subdivisions, or PUDs, can set minimums for house size, a fact bemoaned by the county’s affordable housing study ten years ago. The news is better in parts of the county with general open zoning – land that is not part of a sub-division. The building rules are complicated, but the bottom line is that you can construct a house as small as 400 sq ft, according to the county building official and his staff, who graciously took the time to research the numbers. You also have to meet certain requirements, based on Florida building codes, such as size and number of rooms, which add up to the required sq ft minimum. You MIGHT be able to go a bit smaller than 400 sq ft with careful room planning. Again, this is for a traditionally build home. Don’t get me started on mobile homes, manufactured homes or container homes. Each has its own set of guidelines and approving agencies. But if tiny houses appeal to you, either for year round living or snowbird roosting as you downsize for retirement, you CAN live small in parts of Florida. Just don’t get TOO tiny, and watch the wheels.